The Lenovo Yoga Tablet 8 is a shining example of mediocrity. 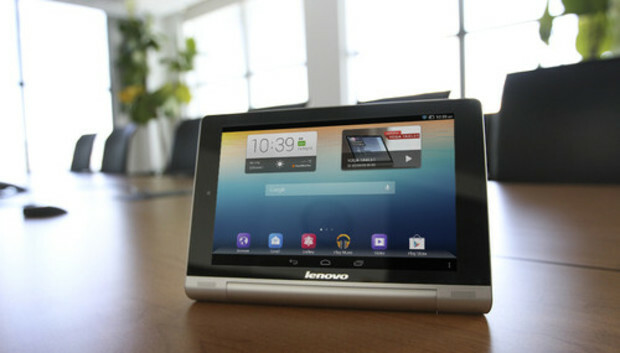 Although Lenovo tried to do something different with the tablet's design, it neglected other important aspects of the device and cut corners in order to keep down the price. What you end up with is a tablet full of compromises--none of them in your favor--that actually costs more than the vastly superior Nexus 7 and Kindle Fire HDX. There's absolutely no reason this tablet should exist and even less of a reason for you to pick one up over competing 7- and 8-inch slates. The Yoga's interesting shape is perhaps the tablet's one high point: By confining the battery to one part of the device, Lenovo made the Yoga easier to hold with one hand than traditional tablets. The tapered, lopsided design also helps to prop up the tablet slightly, making it better suited for typing when you lay it flat on a table. The Yoga's most standout feature, though, is its metal kickstand. Compared to the rest of the device, the kickstand feels solid and lets you know with a satisfying click when it's fully extended and locked into place. Underneath the kickstand is a MicroSD card slot, but you'll have to supply your own memory card (up to 64GB). Unfortunately, using the kickstand is a huge pain. In order to open it, you have to twist the base of the tablet until you can get the stand far enough out for you to stick your finger underneath and snap it into place. The whole process is so backwards that Lenovo had to include a sticker on the tablet detailing how to properly extend the kickstand. What's worse, there's a small slit on the back of the tablet--on the lip of the stand--that almost demands you stick your fingernails in there and try to pry the tablet open. The tablet hinge is so stiff, though, that attempting to open the kickstand with this method will leave you with broken or chipped nails. The rest of the tablet is nothing to write home about: The plastic chassis feels cheap and undependable, like a short drop or particularly intense session of Fruit Ninja would cause it to fall apart in your hands. The plastic is very easy to scratch or dent, making you think twice about throwing the tablet into your bag. Compared to Google and Amazon's tablet offerings, the Yoga feels like a toy, though I'd feel sorry for any kid that got this under the Christmas tree. This isn't the first tablet we've seen with a tapered design--Sony had a few a year or two back--but the Yoga looks like Lenovo's design team ripped off Apple's Magic Trackpad. The two look strikingly similar, they even feature a big power button in the same location, but Apple's trackpad feels better built. The Yoga's 8-inch screen is a good size for gaming and reading books, but magazines, comics, and videos feel a tad cramped. Not that you'll want to read much on the tablet anyways, as its 1280 by 800 resolution makes all content look fuzzy. Going to the Yoga after using the Nexus 7 or any of the retina display iPads made me feel like I needed glasses. Packing a quad-core MediaTek processor and 1GB of RAM, the Yoga's performance is adequate--but just barely. The frame rate drops when playing graphic-intensive games, and the tablet struggles to smoothly play back HD video. I didn't encounter any of these problems while watching YouTube videos or playing simple games like Solitaire, but it's a bummer to have a quad-core equipped tablet this pokey. The one truly impressive feature of the Yoga is its super long battery life. Scoring an impressive 12 hours and 18 minutes in our lab battery tests, the Yoga outlasted all other tablets we've ever tested. It beat out the iPads by a solid 2 hours and just narrowly triumphed over the Surface 2 RT by a mere 13 minutes. This would normally be a major boon, but with the tablet's performance being hit or miss it doesn't really amount to much--kind of like putting nice rims on a junky old car. Although the tablet ships running Android 4.2 Jelly Bean, the interface has been heavily customized with a colorful overlay that makes Samsung's TouchWiz look reserved. There are three themes you can choose from that slightly alter the appearance of certain icons, but they all look largely the same and give off a weirdly childish vibe. The overlay is also weird in that is removes the standard app drawer and just throws all your apps across your home screen as you download them. You can still organize apps into folders and use widgets, but it really seems like Lenovo was doing its best to copy iOS 6. All the stock app icons are square with rounded corners, the folders look similar to the ones in iOS 6, and freshly downloaded apps carry a red badge that says "NEW" and appears suspiciously similar to the ones in Apple's mobile OS. If Samsung got sued for copying the look of Apple's devices, how long before the Cupertino company takes Lenovo to court for copying the aesthetics of its software? With a retail price $20 north of Google's Nexus 7 and Amazon's Kindle Fire HDX, the Yoga is a tough sell and doesn't do enough to warrant its higher price. The long-lasting battery is the tablet's biggest strength, but with everything else being so underwhelming it's basically irrelevant. Stay away from this one and spend your hard-earned money elsewhere.